Provides delicious drinking water that makes ice, coffee, tea, and all other beverages taste their best! Carbon Filtration reduces a large number of contaminants including but not limited to: Chlorine, Alcohols, Benzene, Chloramines, Detergents, Hydrogen Sulfide, Methyl Acetate, THM's, Chloroform, Formaldehyde, Herbicides, Antifreeze, Insecticides, Radium, and bad tastes and odors. 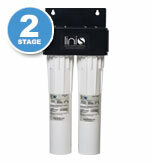 Sanitary Quick Change filter design means no tools and no mess! 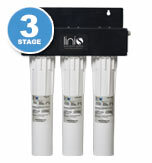 The factory sealed cartridges can be easily changed in seconds with just a quarter turn. 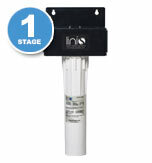 5-Micron Pre-Filter filters out sediment, silt, and solids smaller than the human eye can see. Protects the system from large particles that can break off in pipes or distribution system. 10-Micron Granular Activated Carbon (GAC) Removes chlorine, chloramines and chemicals as well as bad tastes & odors from the water. Polyphosphate prevents calcium and magnesium from sticking to surfaces, inhibiting scale build up. Linis™ pure water systems are offered by Chester Paul Company - Continuing the tradition of service for more than 60 years. All Content © Copyright 2009 Chester Paul Company.